More often than not, work is more than just the nine to five grind with a paycheck at the end of the month. Things like having children, getting hit with redundancy negotiations or going on that well deserved vacation in Bali are a part of the reality of work-life, with tangible off duty effects. Tral presented us with a challenge: All that crucial work-life related information is often shrouded in legalese, scattered across the web and presented in a complex and rather boring way. This drove Tral members to contact the union’s information services by phone. In order to keep up with the increased service demand, something needed to change. 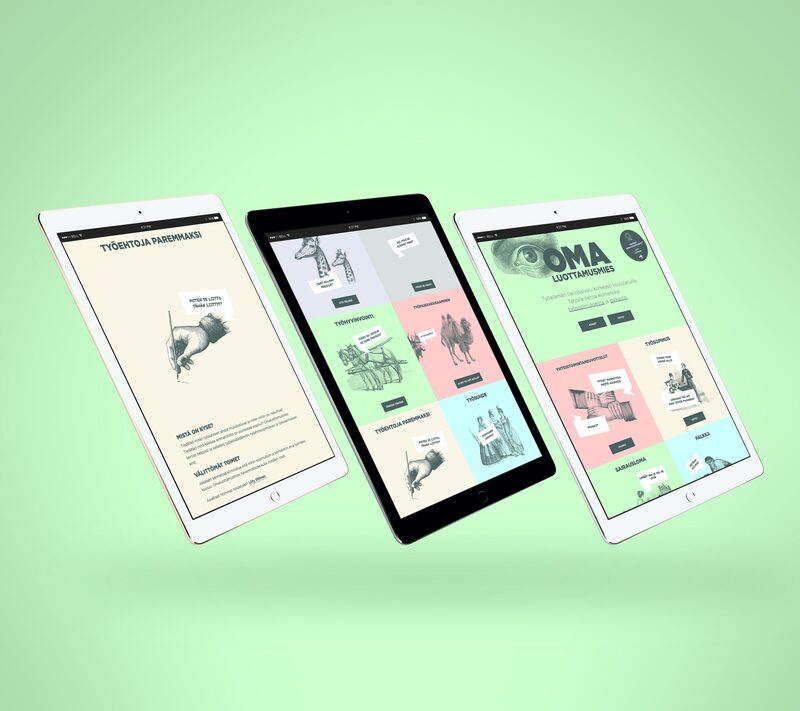 Omaluottamusmies.fi was conceived as an answer to people’s need for everyday work-life information. A service that would easily answer typical subjects ranging from how work contracts are formed, rights to parental leave or how to handle bullying in the workplace. We worked with Tral to chop down complicated issues into bite-sized chunks of essential information, presented through infographics and timelines, with each subject introduced through an approachable tongue-in-cheek style miniature comic designed to encourage social sharing. “We came a long way from the original idea of just presenting work-life related content in several categories with tons of small print to go along with infographics. Looking back at where we started in terms of the concept, it’s quite refreshing to see that we got to create something useful that stands out. A distinct, slightly strange brand and a style of copy that resonates with users on a personal level, while still serving every bit of the hard information we set out to communicate. The service has been a success for TRAL, cutting customer service lines and effectively serving thousands of union members with essential, much sought after information. In the spring of 2015 Omaluottamusmies.fi was bought up by TRAL’s umbrella union, YTN, to serve all of their 22 member unions, spreading it’s utility and opening up new, exciting possibilities to develop the service.